A couple of weeks ago, during a discussion with associates, the subject of the brown-tail moth came up. I figured it was just another of the mundane moths we see during the summer. However, that was not the case. This particular moth, Euproctis chrysorrhoea, is one that we probably could do without. This moth, once native only to Europe, was accidentally brought to Massachusetts in 1897 on nursery stock, and soon spread to the rest of New England, Today, it is found only on Cape Cod and along the coast of Maine, where it is considered an invasive species. 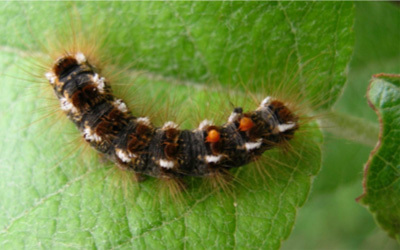 The brown-tail moth is armed with defensive barbed hairs throughout its life span but especially during the caterpillar stage. These hairs break off, and for many people exposed, are susceptible to skin rashes, headaches, and even difficulty breathing. This caterpillar also has a huge host range of plants on which they feed. The brown-tail moth caterpillar has tiny poisonous hairs that cause rashes similar to poison ivy on sensitive individuals. Rashes may develop when people come in direct contact with the caterpillar or indirectly from airborne hairs. The hairs become airborne by either being dislodged from living or dead caterpillars, or they come from cast skins when the caterpillar molts. Respiratory distress from inhaling the hairs can be serious. Caterpillars are active from April to late June. Hairs remain toxic throughout the summer but get washed into the soil and are less of problem over time. The moths, which are attracted to light and fly at night, and active in July and August, have a wingspan of about 1.5 inches. The wings and midsection are solid white on both the male and female. The abdomen has brown on it, and the brown coloration extends along most of the upper surface of the abdomen in the male, whereas the top of the abdomen is white on the female, but the tuft of brown hairs are much larger. The factors underlying brown-tail moth population dynamics are little understood and have been only thoroughly investigated by few researchers. According to the Coastal Pharmacy & Wellness staff, the brown-tail moth has been getting plenty of attention over the past few years. This is because the numbers have spiked to levels that haven’t been seen in quite some time. Last year was a banner year and this year’s population is predicted to be even higher. 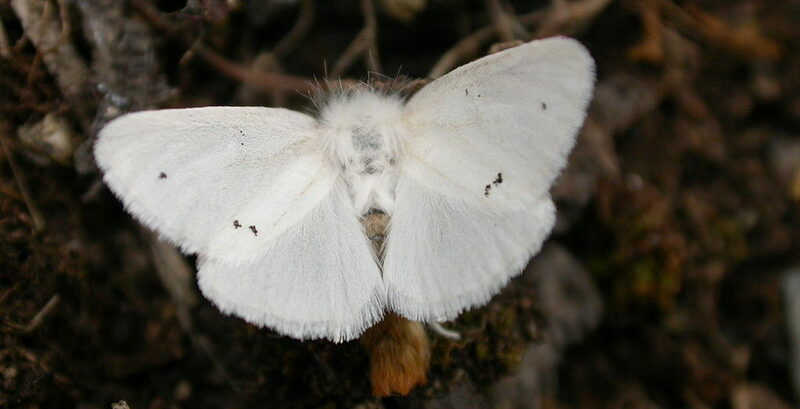 Throughout much of its life cycle, the moth sheds its toxic hairs. Eggs are laid in August-September, when a female can lay up to 400 eggs. They build their winter nest in the fall and remain there from September to June. In June and July, the larvae spin cocoons in which to pupate. The cocoons are full of toxic hairs. The moth emerges in July and August, mate and lay eggs to begin a new cycle. During this period, more hairs are shed to cover the egg mass. The brown-tail moth’s excessive desire to eat, and its habit of feeding on many different kinds of foods, together with its tendency to reach outbreak densities, makes this species a major pest of hardwood forests and may also attack fruit and ornamental trees. Pursuant to Maine Statute Title 22§1444 the Chief Operating Officer of the Maine Center for Disease Control can declare an infestation of brown-tail moths as a public health nuisance. The declaration may be made on the COO’s initiative or upon petition by municipal officers. With his win in game five of the 2013 World Series, Jon Lester of the Boston Red Sox became only the second Red Sox left-handed pitcher to win three World Series games. Who was the first?